Doll Quilt 21" x 26"
This Pretty In Pink doll quilt measures 21" x 26". It is a very versatile pattern. You can select a limited color palette as I have done using only 2 colors or you can have fun and make your wee quilt out of as many colors as you like. It is the perfect quilt to be made from your stash. You can also choose which method you would like to use to make up the flying geese units. This design is simple, modern and very easy to make. 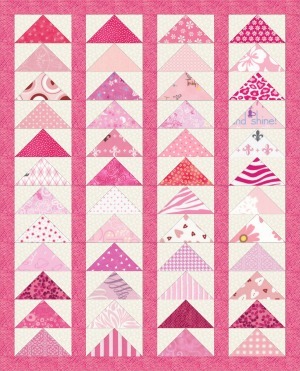 To make this quilt you will need a selection of pink and white fabrics. 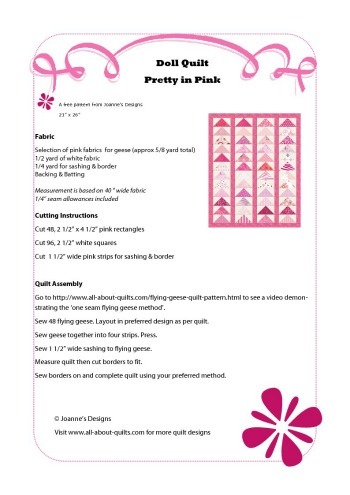 The flying geese method I have used to make this quilt is the one seam flying geese method. For a video demonstrating this method and detailed instructions of a range of other methods for constructing the flying geese block visit my flying geese free tutorial. 2. Cut your fabric into 2 1/2" wide strips first. Then cut the squares and rectangles from these strips. Make up each sandwich unit and chain piece them together as shown on the video by Ricky Tims. 3. Make all the flying geese blocks up first. This can be done quite quickly by using the one seam method. 4. Remember to iron the flying geese open as shown in the video. 5. Once all the flying geese blocks have been completed it is then time to sew them into columns. 6. First arrange your blocks in the desired format. Sew each block together in columns. Sew the sashing to each column as per the diagram.